At Millbrae Montessori School, we are dedicated to provide our students a Montessori inspired & well rounded curriculum experience through a beautiful inviting environment. Our highly-qualified, professional staff work together to create a challenging and nurturing environment with an emphasis on teamwork, fun, imagination achievement, and recognition. We are committed to inspire a lifelong love of learning within each student as they progress to higher learning in Elementary School. Established since 1981, we’ve been serving the childcare needs of the Millbrae Community and creating happy memories and lasting friendships. At Millbrae Montessori School, we provide an environment that makes learning easy, enjoyable and successful. We offer an academic Montessori curriculum that meets the individual needs of each child. Our emphasis is on building independence, self esteem, creativity, and positive social skills. Our priority is to educate the hearts and minds of each child and inspire a love of learning within. We believe in building a strong foundation for the future. To inspire and enhance the educational and creative potential in every child. To provide a nurturing environment where the child can feel safe, happy, and comfortable away from his or her home. To promote self-esteem as well as a positive attitude towards school and learning. To help children become more responsible in taking care of themselves and their surroundings. To provide a stimulating and creative curriculum so that the child can meet new challenges with excitement and enthusiasm. To provide activities for the children to develop large and small muscle coordination. To provide a classroom that is prepared in such a way that all materials for learning are easily accessible to the child. To encourage positive relationships with other children and adults through mutual respect and cooperation. 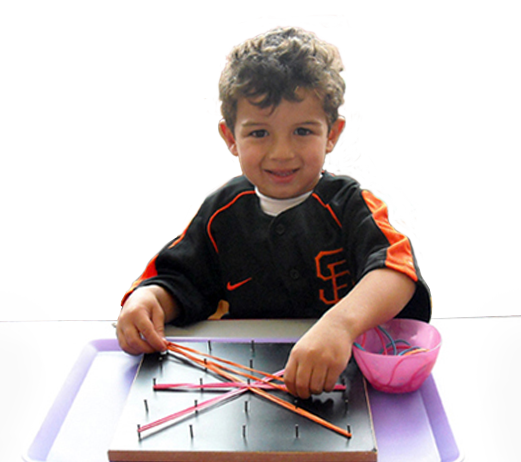 To develop the children's sense of independence by strengthening their problem solving skills. Trevor has blossomed so much since he started attending your preschool. We're so happy with his development and we appreciate all the opportunities your school provides him (not to mention the wonderful snacks & treats!). Teachers at Millbrae Montessori School come from various training programs. All of the teachers are patient and caring, providing each child with a welcoming, nurturing and cheerful environment to work in. The Montessori teacher is trained to be an observer of children and to follow their daily needs. They present new lessons, encourage children to choose appropriate work and oversees all the activities in the classroom and on the playground. Montessori teachers maintain a peaceful and respectful attitude in the classroom. Our well-qualified teachers are Early Childhood professionals, striving to create stimulating and challenging lessons for their students using age-appropriate materials.